Software development Company, custom software application development in Gujarat, custom software development in Vadodara, Offshore outsourcing company Ahmedabad, Software development Solutions, software development company Gujarat, Software Development Companies India. Software development is a complicated process. A lot of people think that good technical expertise in software development is sufficient for a project's success. 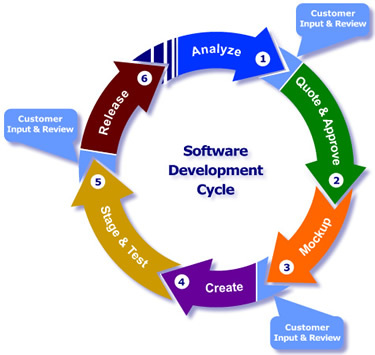 Offshore software development services are intended to serve businesses that are software outsourcing development and programming to India. Our Company is capable of build any kind of software for you - from GUI applications to sophisticated engines and programming complexes. Dhavat infotech develops state-of-the-art, custom software & web based applications. Dhavat InfoTech is an outsourcing software development company with clear focus on high quality, timely delivered and cost-effective software development. It is focused to provide wide array of outsourcing services like website development, offshore software development, Network solution, website hosting, Domain Registration, Hardware solution with high quality that are cost-effective. Offshore software development at Dhavat InfoTech Private Limited also provides you with immediate short-term access to a broad range of specialized technical skills and equipment. Offshore development allows your "A" team to focus on your core competencies. This means you get to market faster while maintaining your technological advantage. Dhavat InfoTech will provide your projects with a detailed analysis of the functional points and time involved in building them. A picture is worth a thousand words and providing you a mockup of the functionality of a new feature sometimes says volumes about the way the system is constructed. Creating the code that powers the program. We give our clients the ability to see features and releases as we are creating them. When the new release has been tested and is on staging, we will then put the release into production for use by our clients and their customers. At Dhavat InfoTech, we believe IT consulting is all about assessing technologies from a myriad of options and selecting solutions which will best meet business objectives and ensure long term value. Our solutions help you organize business and technology strategies - cost effectively. Software development is a highly technical job. To develop software in-house requires time, skilled manpower, and expensive programs and equipment. Offshore development is a cost effective alternative to developing software in-house. We provide both end-to-end solutions - from requirements gathering to application maintenance - and specific design and development expertise. We analyze a project and define its goals, plan a detail roadmap to achieve those goals. By following a rigorous and proven methodology of defining, designing and developing software projects, we turn project concepts into reality.